One of the more delicate flowers…at least in appearance…and this has a lovely background, Steve. You know that I often like to have a contrasting color in the background, but this time I outsmarted myself by not writing down or remembering what the yellow flowers were. 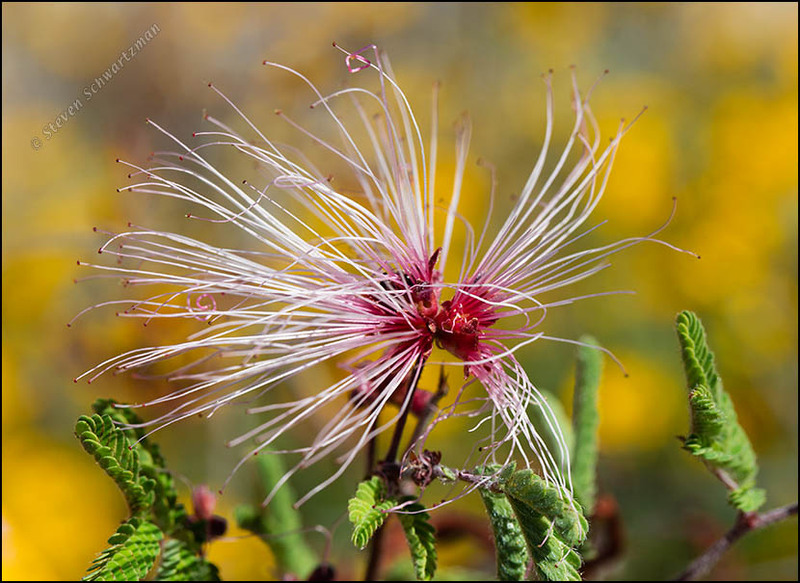 In Phoenix I’d seen a Mexican species of fairy duster, so I was glad to find the native one in Tucson. She does look like a fairy duster, I can imagine it perfectly! On this one you have a more vivid imagination than I do. I’m glad to hear you’ve enjoyed exercising it, but make sure you don’t get too tired out from all your dusting. I like dusting and cleaning almost as much as I like fairies, Steve! But I’ll try not to tire myself out. Good of you to own up to it, Emma, because it’s unusual for a ten[n]ant to do so much cleaning. The fairy duster reminded me of the Albizia http://en.wikipedia.org/wiki/Albizia I used to have in my garden. When I checked on Wiki I realized why the flowers looked similar. I had to remove the Albizia because it created too much dust for my nose. Well, that was one reason but the other was that it was diseased and most of the trunk was rotten. The Albizia julibrissin mentioned in your linked article is a common enough sight in Austin. The tree isn’t native to the Americas, but people plant it here as an ornamental, and its flowers are certainly pretty. I’m sorry to hear about your allergy to Albizia. It sounds like you did the prudent thing in getting rid of it, especially if it was diseased. The Albizia is often seen in Christchurch gardens. The butterflies and birds loved mine but…. Actually, it reminds me of Clematis drummondi. At first glance, I was just sure it was a variant of that. The similarities in the leaves is obvious, of course. I’ll say this — it’s the first time I can remember thinking about chianti before seven in the morning. Some movie lines just stick. I thought about that movie line too but decided to be as meek as a lamb and remain silent. On the last day of my trip I saw some Clematis drummondii in far west Texas, but to the best of my knowledge I didn’t see any species of Clematis in New Mexico, Arizona, or Colorado. Real character for sure! For some reason makes me smile and at the same time sorry, it feels so skinny, so fragile, so light, so vulnerable…yet putting all those aspects aside she is beautiful in her own way, most charming and lovely, just like a fairy. In spite of the seeming fragility, this flower and the plant that produces it can’t be that delicate: they survive and even thrive in the desert, whose harsh conditions create the character you’ve recognized here. Maybe fairies are tougher than we think. Unusual, eye catching, and so interesting on review; this is such a great image. It was a new species for me, Charlie.